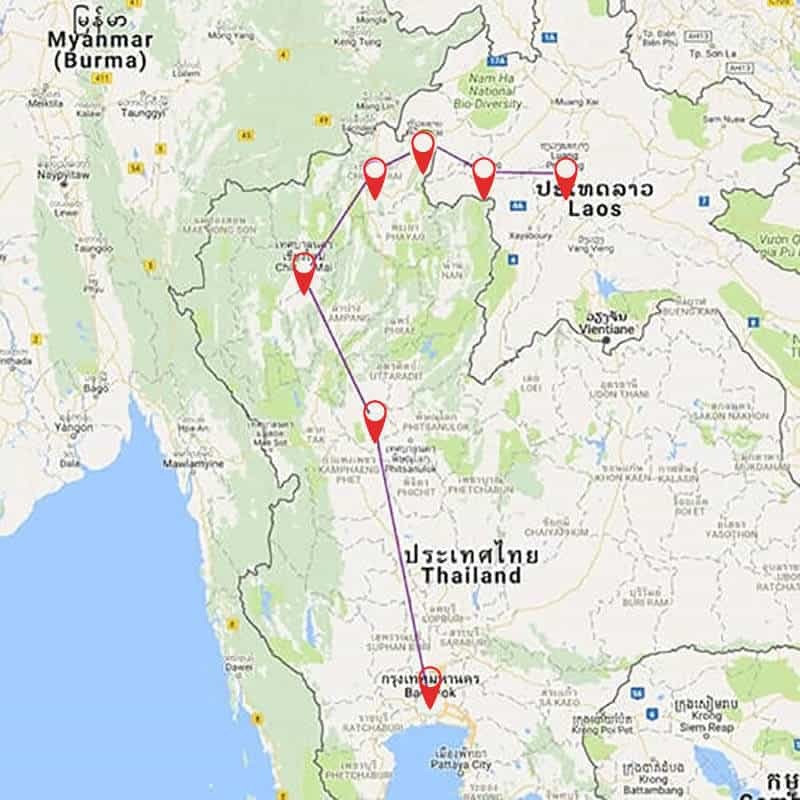 With our 12-day Thailand Laos Adventure Tour, you will travel from Bangkok to Luang Prabang, experiencing irreplaceable memories of rolling mountains, remote villages, tribal crafts and the magic of the Mekong in Thailand and Laos. This tour is perfectly combined to discover the colourful hill tribe cultures of Thailand's northern highlands and to explore the tranquil treasures and rich culture of beautiful Laos. 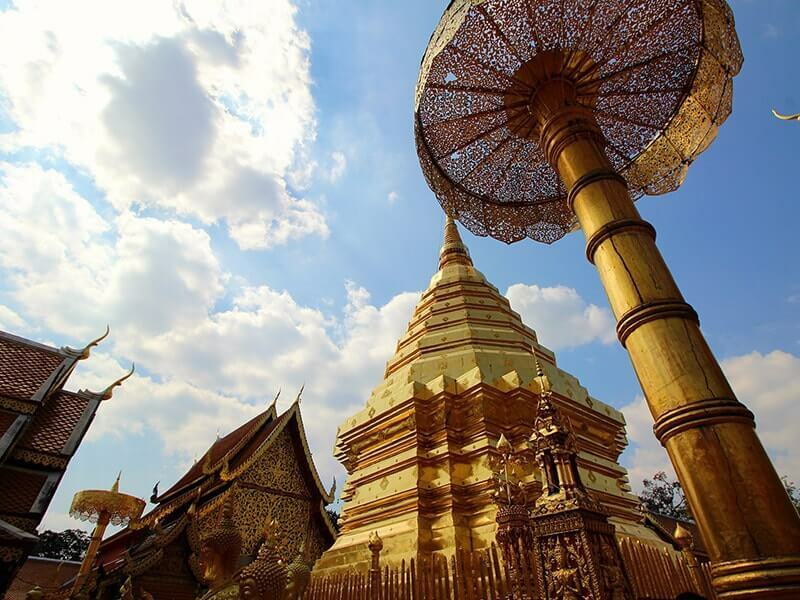 Visit temples in Chiang Mai then spend the evening exploring the night market. 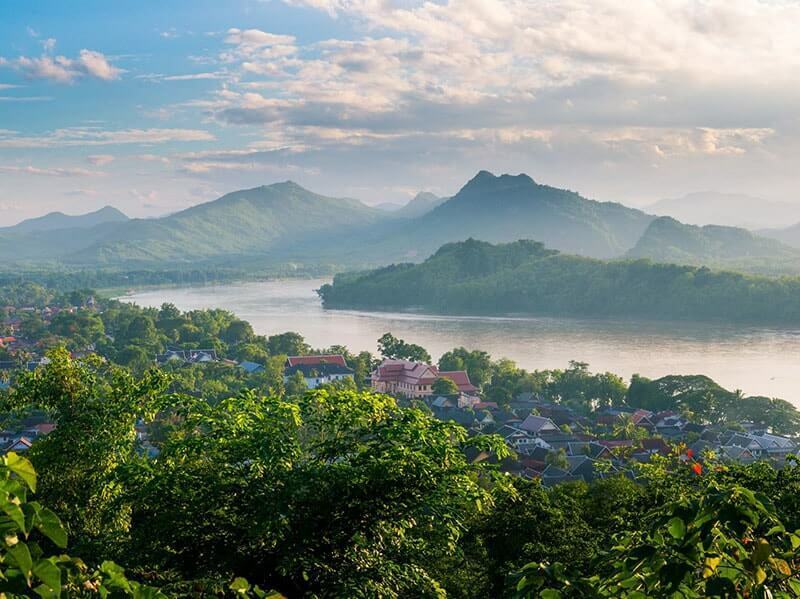 Sail the Mekong into the heart and soul of Laos and become immersed in the tranquility of remote villages and friendly locals along the way. 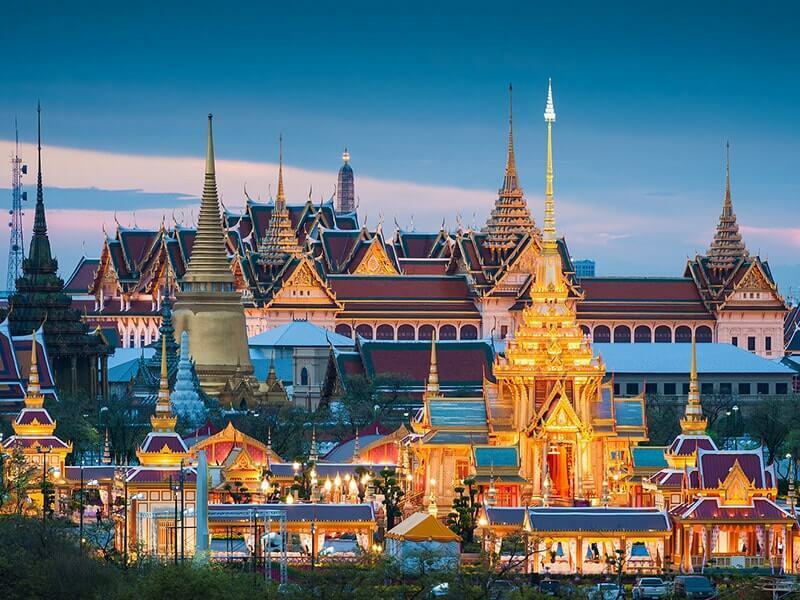 Upon arrival in BANGKOK, the fabulous metropolis of Thailand that rushes past in vibrant colors and endless energy, you will be met at the airport by your guide then transported to your hotel for check in. There is a vivacious mixture of past and present swimming around Bangkok’s streets, filled with sparkling temples and pagodas, equally as impressive as the rising skyscrapers. It is easy to get lost amongst the wonder, from the effervescent aroma of the food to the quiet charm of the Golden Mountain. As you look out through your hotel room window over the expanse of the city, you know the discovery has already begun. After a luscious breakfast of fresh juice, fruits, and so much more you will step out into the city to discover its stunning history set beside the riverbanks and beyond. The Royal Grand Palace is the nation’s landmark and the most revered royal monument. Construction began under King Rama I and has since displayed such spectacular culture such as Wat Phra Kaew, housing the famous and mysterious Emerald Buddha, the symbol of Thailand. The palaces were used for different occasions – the Funeral Palace, the Reception Palace, the Throne Hall, the Coronation Hall, the Royal Guest House. NOTE: Appropriate dress is required (or can be rented on site). Continue your visit to Wat Pho, the home of Thai massage and the Reclining Buddha. After lunch, have some time to refresh then stroll through Chinatown where you visit interesting shops, tea shop, markets and temples to get a first-hand feel for old Bangkok. Next, pay a visit to the Bangkok Folk Museum, a seventy-year-old Thai house converted into a small but fascinating museum. NOTE: Bangkok Folk Museum is closed on Mondays & Tuesdays. Chao Phraya River is known as the “River of Kings,” and was once the most bustling highway in the city. Hop on a long tail boat for a ride along the bustling Chao Phraya River and the quiet klongs (canals) of Thonburi where you see how Thai people have lived next to the water for centuries. Now the water is calm and quiet as you come to the chedi of Wat Arun, the Temple of Dawn, where the spire gleams in the light and acts like a lighthouse against the backdrop of the city where the gentle trickle of the river runs through. The central spire ascends over 210 feet high, decorated with colored glass and porcelain to help catch the light at various angles. You can even climb the stairs to get an expansive view of the river and the surrounding cityscape. After breakfast, you will be transferred to airport for a flight to SUKHOTHAI whose name means dawn of happiness. Founded in the 13th century, it was Thailand’s first capital, overseeing a period known as the golden age of Thai history and is considered by most to be the cradle of Thai culture and ‘Thainess’. 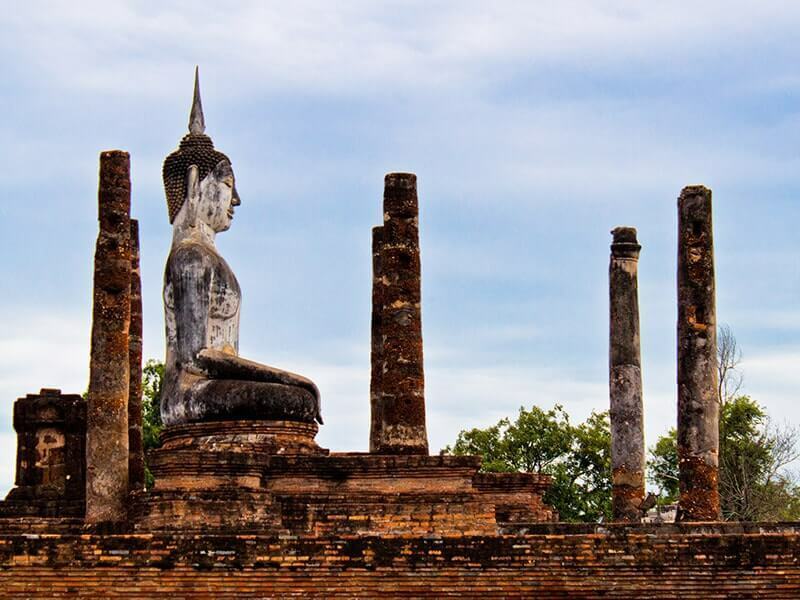 Upon arrival, you will be picked up by your guide who will be awaiting to take you to Sukhothai Historical Park which was once a walled city surrounded by a moat. After lunch, continue to visit the other ruined chedis of the almost 200 ones in remarkable condition, including the main sites of Wat Mahathat, Wat Si Chum, Wat Sri Sawai and Wat Sra Sri and Wat Trapang Ngoen and Ramkamhaeng Museum before heading to your hotel for check in. Bike ride is possible as a supplement in the historical park. A nice and easy way to stroll around the ruins! This morning, travel north to Si Satchanalai Historical Park, formerly called ''Muang Chaliang'' on the bank of the Yom River north of Sukhothai. The ancient town got its name ''Si Satchanalai'' during the reign of Phra Ruang and 134 ruined monuments have been discovered within the park. Continue to visit the main sites of the Si Satchanalai historical park before driving 4 km north to see Celadon Kiln Site Study and Conservation Center at Ban Ko Noi. Head north towards Chiang Mai via LAMPANG, with an optional stop to visit Wat Phra That Lampang Luang. Arrive in CHIANG MAI in the late afternoon. Check in the hotel then free at leisure. We recommend having a local dinner at a riverside restaurant, followed by a stroll at the night market for handicrafts or souvenir shopping. Drive thirty minutes north of Chiang Mai city to a long-tail boat dock, then embark on a longtail boat along the rural Mae Ping River and enjoy a 30-minute cruise. Along the river banks, you will be confronted by traditional wooden houses and modern residences. Reach a boat landing and walk for about 10 minutes to Warorot fresh food market or Kad Luang in another name for a visit, experiencing the Northern Thai way of life. Take a trishaw ride along Tapae Road, passing City Walls and along Ratchadamnoen Road to Wat Phra Singh. Stay until in the late afternoon, when the tourist masses have already left the temple grounds and dusk will give a very special atmosphere. After your private blessing ceremony, witness the magical evening chanting of the monks. Wrap up with the spectacularly romantic evening view over Chiang Mai city with its millions of glittering lights. Overnight at hotel in Chiang Mai. 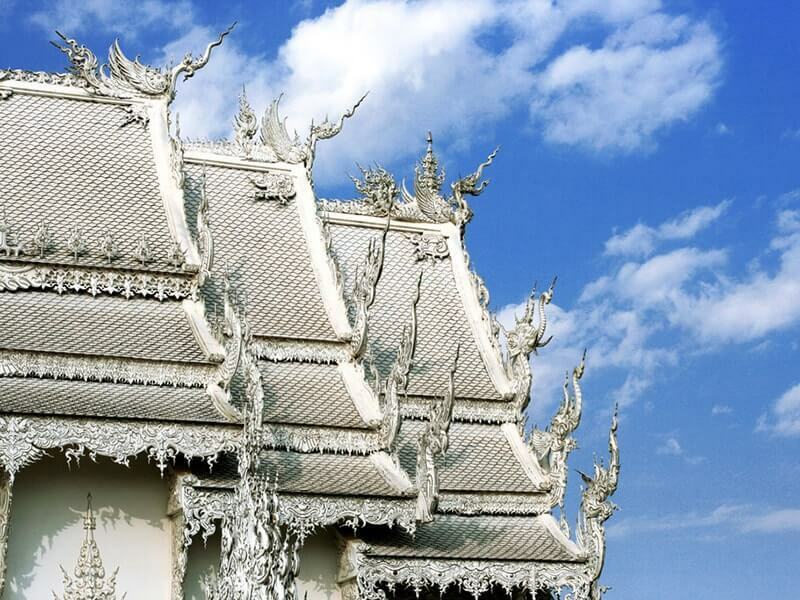 Today, drive to CHIANG RAI, the most northern city of Thailand and is considered the birthplace of the country. It takes around 3 hour drive to reach the destination. Arrive in Chiang Rai and stop for lunch then head for a visit to PDA Hill Tribe Museum and Education Centre. The forest surrounds the city of Chiang Rai, the largest northernmost city in Thailand. Amidst the rolling hills and lush trees of the countryside, the city is filled with an air of purity reaching outward from the unbelievable snowy color of the White Temple. It almost looks as if the tiered triangular roofs were carved from ice. Take some time to marvel at the bizarre, yet profoundly beautiful decor and artwork of this one-of-a-kind temple before proceeding to CHIANG SEAN - a former Lanna principality dating back to 1328. After breakfast at the hotel, visit the area of the ancient Chiang Saen. When looking around the city, it is easy to find out inspired architecture influenced by Burmese and Thai, representing the eclectic mixture culture and history that has created the sensational city. However, when you venture outside the city you can still find the traditional communities that persist in their villages throughout the countryside. The Akha who is originally from Tibet can be found along the rolling plush hills throughout Southeast Asia. The villages tend to rise on stilts, climbing and falling with the landscape, draped in woven straw. 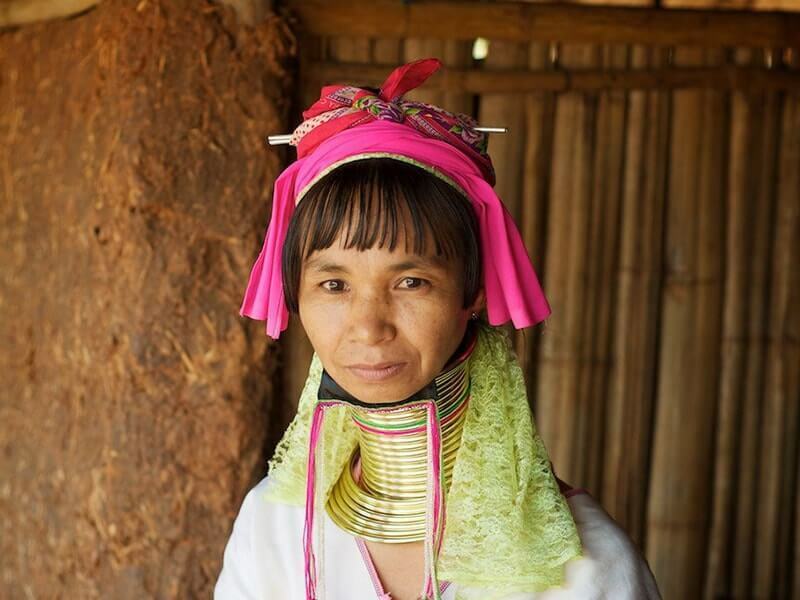 The women have colorful dress, from dangling strings to graceful headgear. They thread cotton with a hand spindle and eventually dye their clothing with indigos and vibrant colors. Continue on to MAE SAI, a bustling trading town at the northernmost border between Thailand and Myanmar. Cross the border into Myanmar, and witness the local life in a nearby village. Take a rickshaw to explore the town and its Shan-style temples while riding through lanes and small side-streets. Wrap up the morning at the local market, famous for wonderful goods from Southern China, Myanmar and Laos. After lunch, a tour will eventually bring you to the Golden Triangle, a space where three countries, Thailand, Laos, and Myanmar, meet along the river. Then take a longtail boat to view the splendour of the mighty Mekong River joining the Ruak River and forming the “triangle” with these countries. There is something amazing about the beauty of land where these countries meet, where you can watch the river wind along the sensational green, and where, instead of an “X,” golden spires and statues mark the spot. Today, head towards the Chiang Khong border where your Thailand guide will assist you to clear clear immigration and customs at Thailand’s border. After that, you will be picked up by your Laotian guide then transferred to the Huay Xai boat station, before embarking on a boat to begin our two-day journey down the Mekong River (6–7 hours today). NOTE: Please bring 2 passport photos per person and cash in USD for the Lao Visa on arrival. Your Laotian guide will be waiting after clearing immigration at the other side of the bridge (Huay Xai). Transport will be provided by road (approximately 9km) to the pier to board the Mekong boat. While the boat is basic, the journey is relaxed, a lovely way to experience the slow pace of village life and gorgeous scenery along the river. On the way, visit villages of the Yao or Lu tribes where a stroll around the village will provide a firsthand look at the traditional rural life of these people. 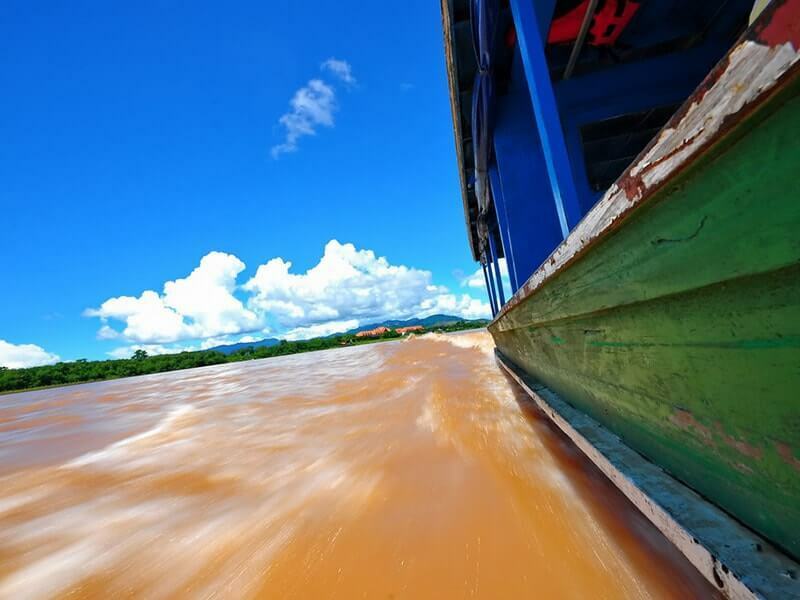 Lunch will be served on board as you continue your cruise along the scenic Mekong River. Arrive in the town of PAKBENG in the late afternoon. Dock at the small trading port of Pakbeng and spend the night in a basic guesthouse. This small town is lined with wooden houses along a steep street on the hillside and is quite dynamic. Check in the guesthouse then relax. In the early morning, take a visit to the colorful local market. After breakfast, depart around 08.30 am for the second leg of the cruise. En route, stop to visit Pak Ou Caves with sacred caves of Tham Ting and Tham Phoume housing hundreds of Buddha statues. Enjoy a buffet lunch on board after the visit. In the afternoon, stop at a hill tribe village to watch the traditional process of Lao whiskey production. Arrive in the laid-back town of LUANG PRABANG, full of golden temples and where hundreds of monks walk the streets. Just before sunset, meet with your guide for a walk to the top of Mt Phousi, 328 steps to enjoy the panoramic view of the city and the surrounding countryside. Descend to the Mekong side of the peninsula and find yourself in the evening hill tribe market. Here where you may find plenty of local souvenirs to buy such as handicrafts and textiles. Self discover the night market at your own. 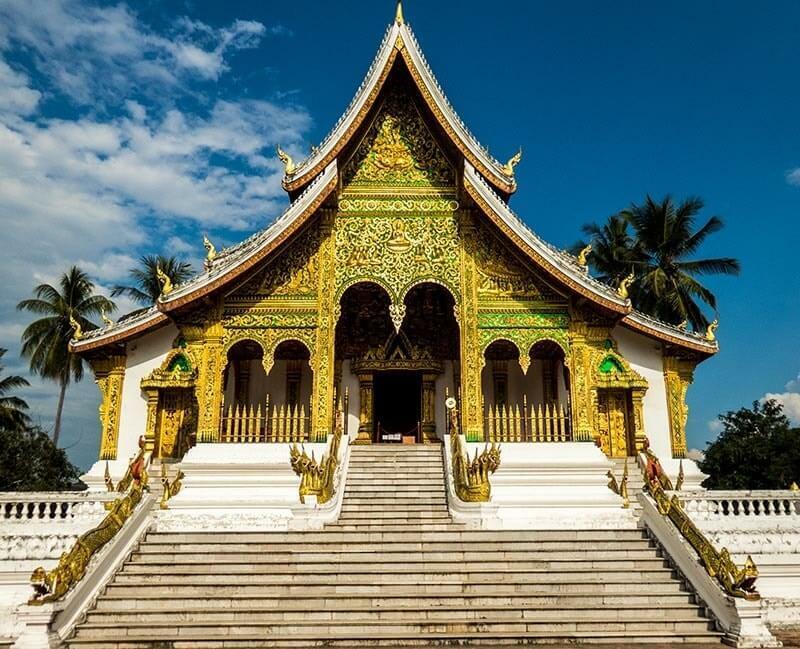 This morning, start your Luang Prabang City Tour with a visit to Wat Xieng Thong - one of the most important of Lao monasteries and remains a significant monument to the spirit of religion, royalty and traditional art. After that, move to Wat Sene Souk Haram or literally "Temple of a 100,000 treasures" is one of the most beautiful temples in Luang Prabang, singular by its restored painting of a deep ochre colour, flamboyant and glittering with gold. Then continue tour to visit the impressive stupa of Wat Visoun (oldest temple in Luang Prabang) and the shrine of Wat Aham. Tasting the best of Laos in restaurants which are suggested by your guide. NOTE: National Museum closed on Monday. After that, continue to Wat Mai - one of Luang Prabang’s largest and most richly decorated temples. Both its interior and exterior are extensively adorned with black and red lacquer decoration and gold leaf. We finish our today’s tour with the Traditional Arts & Ethnology Centre, a private, non-profit museum which is dedicated to the preservation and celebration of the many ethnic minorities existing in Laos. After breakfast, take a short transfer (40 minutes) to Long Lao Village which is the start point of today’s trekking tour. On the way, pass vegetable gardens and rice fields before reaching the forest. Our guide will deliver you some information about the wild animals, birds, plants and medicinal herbs which you could see in the forest. Upon arrival, observe the daily life and explore the unique culture of Khamu and Hmong people who live in village. After a few kilometers of trekking, stop to explore a cave which was used as a shelter during the Vietnam - American War. Then continue go along beaten track, passing through the jungle and reach to Kuang Si Waterfalls where you can relax, swim on a hot day. The falls cascade over many calcified tiers and down several hundred feet into a series of cool, turquoise pools. 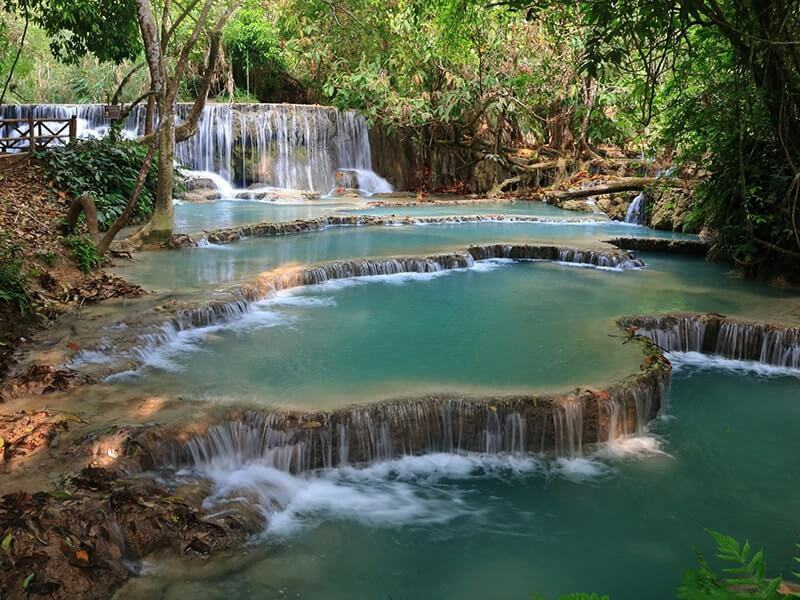 Have your picnic lunch next to the Kuang Si Waterfalls. Before returning Luang Prabang, visit the Asian Black Bear Rescue Centre, a conservation centre that rescues animals from the wildlife trade. Meet the cute furry residents and learn about the efforts to protect Asia Black Bears in the wild. Drive back Luang Prabang and free at leisure. Wrap up your Thailand & Laos Adventure tour. You have visited best highlights of Thailand and Laos, from picturesque landscape, tranquil villages, ancient capitals, tasty food and cuisine to iconic museums within a culture that was once foreign but is now familiar and endlessly friendly. 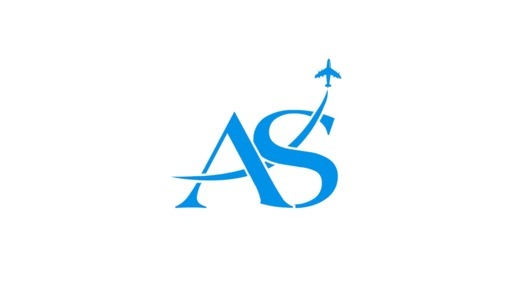 Laid back until your private transfer will ferry you to the airport where you will catch your return flight home. For additional tour options, read about other Vietnam tours offered by Asia Senses Travel. For traveler experiences, read the Laos tours reviews.